A Theory of Mind (ToM) is the knowledge, which enables you to predict and manipulate the behavior of others. It covers an understanding of their intentions, including their beliefs, pretences, desires, emotions, and motives. The term ToM was first introduced by Premack and Woodruff in 1978, in a paper titled "Does the chimpanzee have a theory of mind?" Simon Baron-Cohen, who is famous for his work on autism, calls the ToM ability “mind reading.” An elementary knowledge, which manipulates the behaviors of others exists in all living things. 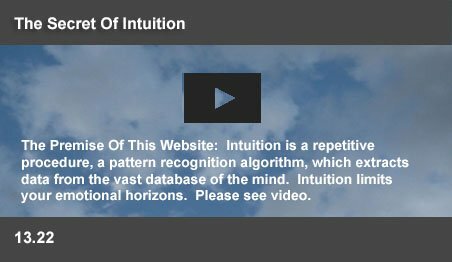 ToM, an awareness of the thoughts and intentions of others, emerges as a later development through a second level of intuitive pattern recognition by the mind. Since ToM is virtually absent in children below 2 years of age and appears to be impaired in autism, there are several theories about this augmented ability of the mind. Theory-Theory (TT) describes ToM as an innate theoretical process. Simulation Theory portrays ToM as knowledge gained by mentally stepping into the shoes of others. All living things manipulate each other at various levels. An infant learns early that its cries will manipulate the behavior of its parents. But, it does not understand their mental states. The ToM of a mother makes the intentions and desires of her child transparently visible to her. This article suggests that ToM develops, when sufficient simulation data and self knowledge accumulate in the mind of a child. At this stage, intuition, a pattern recognition algorithm, holistically evaluates the added knowledge to generate the Theory of Mind of the child. A mature ToM sees meaning in the behavior and actions of other people. It creates order in life by giving surrounding events purpose and meaning. ToM prevents us from being overwhelmed by the complexity of daily life. When you know why something is going to happen, you can adjust better to the situation. The possession of an effective Theory of Mind is a valuable leadership skill, since it can be used to influence the behavior of others. It grants leaders the empathic ability to imagine being in their shoes. Knowing the intentions and desires of their followers enable leaders to plan and direct courses of action, which can create enthusiastic support. So also, a successful negotiator uses a powerful ToM to change the stance of his adversary. A false belief task provides a basic measure of the ToM of a child. The faculty exists, when a child knows that others can have wrong beliefs about the world. To achieve the ToM ability, the child gains experience in the acquisition of knowledge. It learns that other people’s beliefs are based on their knowledge, which can differ from reality. It becomes aware that people’s behavior can be predicted by knowing their beliefs. In a typical false belief task, children are shown the dolls, Sally and Anne. Sally has a basket and Anne, a box. Sally places a marble in her basket and goes away. Anne picks up the marble from the box and places it in her basket. Sally returns. The child is asked where Sally will look for the marble, on her return. Most children after age 4 will answer that Sally will look in the basket, passing the test. These children have a ToM, which can predict behavior based on understanding the mental states of others. Below the age of 4 the child will usually answer that Sally will look in the box. Most of the children diagnosed with autism are also unable to pass the false belief test. Children below 4 years of age and autistic ones lack a competent ToM. One view of ToM is that the human mind has a folk psychological ability, which emerges from an inbuilt “theory-theory” embedded in our common sense. While humans use this theory, they are not aware of its laws - a large number of universally applicable conditional statements. These are empirical laws, which express the relations between the various constituents of TT. They are not dependent on individual knowledge and successfully predict human behavior. TT can be explored, without considering individual viewpoints. They do not depend on cause and effect relationships, but on the actual experiences of beliefs, desires, grief, fear, pain and hunger. The framework of these laws is similar to the theoretical framework of science. Since the laws are absolute, even computers, which process these laws can use them to predict human behavior. The assumption is that ToM emerges, when the nervous system processes the TT laws. TT suggests that there may be a logical "ascent routine," where answers about your TT will logically lead you to your final conclusion. The theory is that one ascends from a theory to a conclusion. This website suggests that pattern recognition by the nervous system through combinatorial codes have the same effect as the TT laws. The discovery of this coding revealed how nerve cells identify the subtle differences between millions of smells. It is suggested that the same decoding process enables the nervous system to finely categorize sensory perceptions, including light, sound, taste, touch and smell into objects and events. Combinatorial pattern recognition can store galactic volumes of inherited and acquired knowledge. Intuition logically focuses on the right answer from this massive knowledge base through instant elimination (inhibition) of unrecognized categories. Intuition makes the mind holistic. It evaluates everything it knows (all the TT laws) to understand the context of the current situation. Intuition enables TT. Intuition is holistic. It evaluates your total knowledge to arrive at a theory. Your theory about any situation can be discovered by asking yourself a hypothetical question. Your intuition instantly evaluates everything you know to deliver an answer. Is a straight line the shortest distance between two points? You don't know of a shorter path. Your answer is likely to be “Yes.” You will disagree if you know any fact, or emotion which disagrees with it. Theories are merely generalizations of your knowledge. You do not ascend from a theory to a conclusion. You proceed from everything you know to a theory. “Operant Conditioning” is the term used by science to describe the process of recognition by humans and animals of the negative impact of external objects and events. Behavioral psychologists suggest that emotional signals extrapolate subtle relationships in predicting future events. According to the “Relational Frame Theory" (RFT), ToM follows learning to verbally discriminate the relationships between self, others, place, and time. A child, which felt sea sick on a boat may exhibit anxiety, with just mention of the word “car ferry.” RFT suggests that a child's fear of “car ferry ” is “Pavlovian Conditioning,” through associations of words, because the child has never been on a car ferry. Operant conditioning and RFT are indications of intuitive processing by the mind. Nature assembled knowledge over millions of years to predict and respond to the behavior of non-self objects. At a primitive level, knowledge exists in the genetic codes of a thorny bush, enabling its unfriendly structure to save it from being eaten by others. The genetic DNA codes of a human being, if tightly packed into 500 page books, will fill the Grand Canyon 50 times over with those books! While genetic codes provide one level of knowledge, equally massive neural combinatorial codes form the basis for inherited and acquired nervous system knowledge for humans and animals. Intuition enables the system to extract instant answers from this galactic database. ATheory of Mind, is the highest layer in the stores of knowledge in the nervous system. An effective Theory of Mind is founded on many assembled layers of pattern recognition skills. At the lowest level, the system recognizes objects and evens. The somesthetic association regions of the cortex recognize objects by touch. When this region is damaged, a blindfolded person cannot recognize a pair of scissors by touch, although he can feel them. Other sensory perceptions including, light, sound, taste and smell enable numerous dedicated regions of the cortex to recognize objects and events. These association regions enable animals to distinguish between self and numerous other identified objects. Only recognizing the activities of non-self objects can the nervous system proceed to identify their intentions. These regions provide the lowest pattern recognition layer in the complex recognition structure, which finally develops a mature Theory of Mind. To recognize the intentions of others, an animal needs to register and remember their (often painful) impact on its own life. The amygdalae are neural organs, which recognize and react to externally inflicted pain. Developed early in evolution in fishes, these organs store specific memories of sensory signals, which cause pain. Beginning with a memory for odor signals, the amygdalae added memories for all sensory signals, which predict the possibility of pain. Research indicates that these organs condition animals to fear painful events by remembering and responding to sensory signals, which suggest the possibility of pain. Through a phenomenon called long term potentiation (LTP), nerve cells in the amygdalae react more quickly to danger signals. Their signals trigger the increased reflexes and facial expressions of fear. The amygdalae identify the intentions of others at a primitive level. The so called mirror neurons enable you to visualize being in the shoes of others. fMRI studies of human participants have shown that regions containing these neurons are active when one person sees another person's goal-directed action. Researchers also found that certain cells, which normally fire when a needle poke causes pain, will also fire when the patient watches another patient being poked. In the animations of moving geometric shapes, Functional imaging showed that humans distinguish social interactions, laden with intention and emotion, from a random or deterministic motion. The studies show similar patterns of activation in animals during the perception of such animations. Subsequently, research on the neural basis of ToM has diversified, with separate lines of research focused on the understanding of beliefs, intentions, and more complex properties of minds such as psychological traits. Simulation Theory suggests that ToM about others is based on stepping into their shoes. Simulation is possible only after an understanding of one's own mental states. Mirror neurons add data about the feelings of others. ToM is possible based on the acquired experience in the field. Combinatorial codes may store much of the inherited or acquired knowledge. 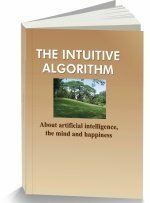 Intuition, which enables an understanding of the intentions of others is based on higher and higher levels of pattern recognition. Lower levels differentiate non-self entities in the environments. Codes assemble memories of their past comments and reactions. Mirror neurons enable the system to add data on the current pain, or pleasure of others. When sufficient data is accumulated, the mind is able to sense the beliefs of others, based on their own beliefs and experiences. Premack and Woodruff's article asked "Does the chimpanzee have a theory of mind?" Do other animals besides humans have a genetic endowment and social environment, which enables them to acquire a ToM? Non-human research illuminates the nonverbal behaviors, which signify components of ToM, pointing to possible stepping points in the evolution to reach a uniquely human aspect of social cognition. While it is difficult to describe states which indicate a “mind,” researchers have focused on simpler components of more complex capabilities. For example, they focus on animals' understanding of intention, gaze, perspective, or knowledge of what another being has seen. Other studies on the understanding of intention in orangutans, chimpanzees and children showed that all three species understood the difference between accidental and intentional acts.